every Year 4 child had an acting part, with each class taking one of the three acts. 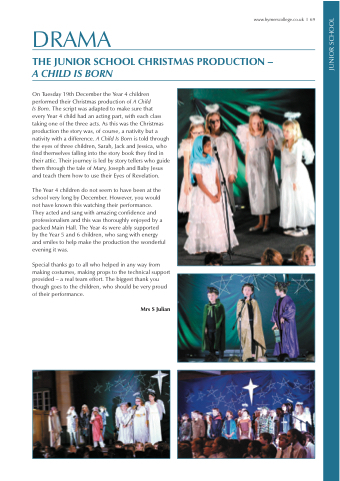 As this was the Christmas production the story was, of course, a nativity but a nativity with a difference. A Child Is Born is told through the eyes of three children, Sarah, Jack and Jessica, who find themselves falling into the story book they find in their attic. Their journey is led by story tellers who guide them through the tale of Mary, Joseph and Baby Jesus and teach them how to use their Eyes of Revelation. The Year 4 children do not seem to have been at the school very long by December. However, you would not have known this watching their performance. They acted and sang with amazing confidence and professionalism and this was thoroughly enjoyed by a packed Main Hall. The Year 4s were ably supported by the Year 5 and 6 children, who sang with energy and smiles to help make the production the wonderful evening it was. Special thanks go to all who helped in any way from making costumes, making props to the technical support provided – a real team effort. The biggest thank you though goes to the children, who should be very proud of their performance.